The 100 per cent record is over and Selkirk FC are off the top of the Lowland League, albeit still very early in the season. However, coach Ian Fergus said last Saturday’s slender loss at Cumbernauld marked the first time he had ever come away from a defeat praising his players because they were the better team. 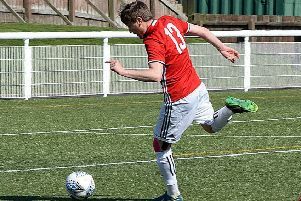 The Souters went down 1-0 at Broadwood to Cumbernauld Colts – a team Fergus rates very highly – after a quite brilliantly worked overhead kick proved the only thing to separate the sides. Fergus knew a cautious approach would be needed, despite Selkirk’s incredible 10-0 mauling of Hawick Royal Albert last midweek, coupled with their 5-1 deconstruction of Whitehill Welfare on the opening day. However, despite disappointment at losing, he felt Selkirk had performed very positively and the match had been a fine advert for the Lowland League. “Over the piece, we were the better team but I will again compliment them (Colts),” he said. “They are a very, very good young side and knocked the ball about well – but they were matched all over the park by us. “We had three clear-cut one-on-ones with their goalie (Sam George) and missed them. We had a few good opportunities near the end, so probably deserved to win the game. “But they scored a goal you could not defend against – an overhead kick, after their player had taken a long ball on his chest. If it had been on telly on Saturday night, it would have been goal of the season. The decisive goal came late on as Colts were awarded a free kick five yards inside their own half. Kerr played a long ball into the Selkirk box, which Sean Brown controlled on his chest and caught ‘keeper Gregor Amos off guard with a remarkable overhead kick. At the start of a season, Selkirk would gladly have taken six points out of nine and a big goal difference, said Fergus. Selkirk had been due tomorow (Saturday) to travel to Burntisland Shipyard in the Football Nation Cup, but the match is postponed, as the Fife side is in the preliminary round of the Scottish Cup, which takes priority. Selkirk will instead be playing a friendly match at 12.30pm at Yarrow Park against a development reserves Livingston side. Fergus intends to field a number of U20 players and youngsters who have not had much game time so far.